Hey guys! These are my nails for the #LLGarden prompt on Instagram! I knew I wanted to do something with my new butterfly punches, but this came out totally different than my original plan! I still might do that some day. My favorite butterfly is the Blue Morpho. They are huge blue butterflies with black edging around their wings. I was going to use one of my iridescent blue OPI's for this, but changed my mind! 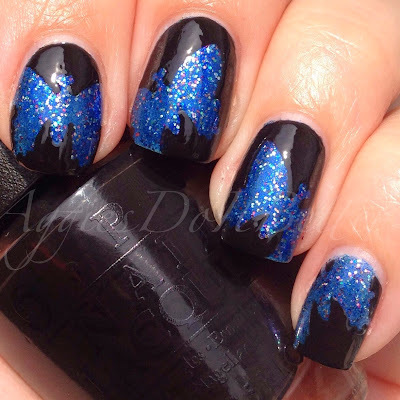 I took artistic license and used Orly Macabre Masquerade , which you can see on its own at the end of this post. 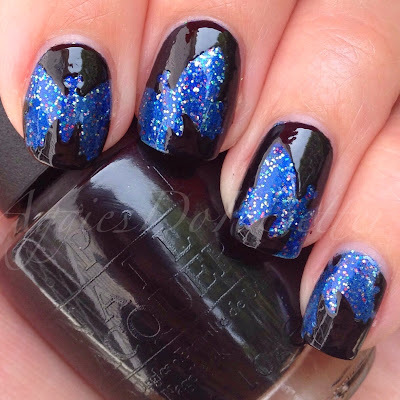 I wore it for a day and them used my new larger butterfly punch out as a reverse stencil and painted over it with OPI Black Onyx. One layer of Seche vite topcoat and that's it! I really like how it turned out-very different for me! Here is the Orly on it's own. It's Macabre Masqueradea blue jelly base with micro red and silver glitters. 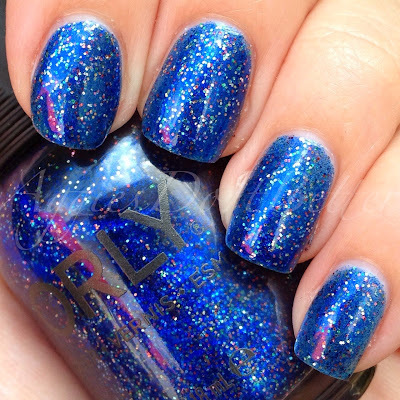 This was part of the Orly holiday collection that came out this past winter, and when I saw this, I thought, how patriotic! It looked red,white, and blue to me. I snatched it up and put it away for 6 months, and now here it is! This is 2 coats. I just love it! Zoya Summer 2014 PixieDust Swatches and Review! Picture Polish Badass with comparison! Nautical Nails for Memorial Day! Butterfly Nail art with Zoya Bubbly Collection! Yellow nail art inspired by Instagram!